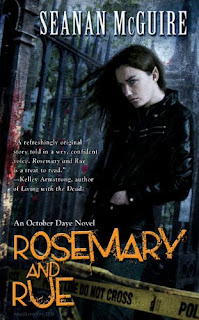 Rosemary and Rue is one of those novels I love and had so much fun with, I almost don’t want to screw those super fantastic feelings of glee with a review. I could flail and talk so fast with phrases such as, “OH MY GOD I LOVED THIS BOOK YOUGOTTAREADIT,” but really, that’s not too convincing and wouldn’t get me anywhere except (most likely) kicked out of whatever quiet place I’ve seen fit to have an explosive fan moment inside of (church, library, cemetary, etc...). I’m going to try my best not to devolve this review into my base reactions and give you something I’m a little more proud of. There are so many things to enjoy about this book. Seanan McGuire has an amazing (and, as it turns out, educated) perspective on Faeries and folklore. Rosemary and Rue is peppered, née, doused liberally (dipped and drenching in) the type of Faeries nightmares are made of: selkies staking out San Francisco streets to lure gullible citizens into the murky depths of the bay; piskies with nasty tempers; even the more well-adjusted species have their darker sides. With so much hierarchy in the still very feudal Fae ruling system, it was almost surprising to see similarities between how the Fae conduct themselves regarding humans, an “interesting diversion” (p. 127), and how the Greek gods did. References to Titania and Oberon came against phrases like “First-born” (p. 306) to strengthen this connection, making the Fae of McGuire’s world into a pantheon of legends. Quite naturally, as all larger than life figures, the penultimate Mother and Father of Faerie are spoken of in hushed tones, the realities of their lives having risen into mythological obscurity. The ambiance of the text reflects this grandeur and finds a sense of rootedness in time as well as place. It’s in this world of ages that suddenly McGuire lets lose an absolutely amazing cast of likable (albeit sometimes “love to hate”) characters. The Cait Sidhe--Tybalt and Julie in particular--are my favorite. I won’t be able to look at another cat again without thinking it’s a secret spy from the Court of Cats. If you think the Cait Sidhe are the only mercurial rival to their domestic feline counterparts, you’ll need to take another look at McGuire’s Fae. It seems as if nearly every species is equal parts temper and unpredictability. Tobes experiences this first hand when she’s not only confronted by a nasty Red Cap with a gun full of iron bullets, but a Doppelganger as well--vicious and wickedly dangerous the moment Tobes drops her guard. As our narrator points out, “It all came down to blood and roses” (p. 311), a generous reminder that getting injured and regular physical reminders of the importance of her mission are largely what drives Rosemary and Rue forward. For all that I loved this novel, I almost felt it should have been called “Blood and Roses” instead! If you want a fresh, exciting, and utterly un-put-downable story of multicultural faeries where the unwritten rules of the Fae are archaic, but elegant and operate on propriety, where Pixies sweat glitter, and where it’s impolite to say “thank you,” where a woman fighting tooth and nail for a chance to be happy only to discover she has friends in more places than she ever imagined, then you absolutely have to read Rosemary and Rue. I’ll be quite ready to pick up my copy of its sequel (and all subsequent releases), A Local Habitation, on March 2nd. Alright, I am going to pick this book up TODAY. Both you and TJ have raved over it! I must read it!!! I am SO glad that you enjoyed this series, because I am HOOKED myself. I, too, am really hooked on the cat characters (and indeed it looks like Tybalt is shaping up to be the fan favorite). Now get A Local Habitation so we can flail together and discuss the most recent happenings in the Toby world. Because ALH is even more awesome than R&R! @Lily: I agree--you must read it. :) I think you'd like it and now's the best time! A Local Habitation is out tomorrow. @TJ: I love Cait Sidhe!! I'm going tomorrow to buy a copy of ALH and wil jam it into my reading schedule. Seriously, I loved this book. There shall be much flailing.